May 2014 we had a gathering from Uncles and Aunts at Large for a workshop on making jam - regular cooked jam and freezer jams. It was wonderful to have some young men cooking with the group. 2014 Classes now available! We are now ready to offer classes on the following schedule or can set up a class at a time and place that works for you. I love the bounty of fruit and herbs we are given each year. If you follow us and our products you will know that we make a wide variety of products with our main local fruits such as rhubarb, raspberries, sour cherries, pears, apples and crab apples. Then little gems appear like Honeyberries, local plums, concord grapes, apricots and assorted herbs. These little treasures are usually in small amounts that we believe should be highlighted as a prime ingredient instead of being lost in batches of Bumbleberry or Mixed Fruit jam. The problem was how to market these small batches? Finally, in our consultations with Alberta Agriculture a solution was found - Limited Edition Jams. Limited Edition is defined as 'limited to a small number of copies'. That fits what we want to do. We have the small amounts of unique fruits and the ability to make some unique jams or condiments with them. They will be created in our hand-made method - batch by batch and our wonderful cooks will play with flavours - as they like to do - to create something unique and flavourful. For those who would like to be part of this little adventure, we invite you to join our Limited Edition Jam Club. Link here for details on the different options - all of which will include Limited Edition products. They will be assembled and delivered to a variety of locations in the area in the last week of the month. We already have product ready to go and more will be made as the demand increases so let's get started!!!! The application is here. As you and your company plans for team and group events for the next year, would you consider doing something that pays a Triple Dividend? Let me explain. We offer 1 day workshops for volunteer groups where you will work with us for the day. Class description is here. There is a fee for the day but the payoff happens for the Self, the Environment, and Others. Self: Each person attending will learn about the abundant urban fruit that grows in the city and is not being used. During the months of July - October, participants will assist in picking the fruit, learning how to prepare it for immediate use or save to be used later, and finally in making a jam and/or jelly. They will learn how to blend spices and herbs to create a unique flavour combination and finally prepare product to take home with them. It is truly a hands-on experience. Environment: By learning about the amount of fruit that grows in the city, participants will become more aware and learn options for its use rather than garbage. Fruits of Sherbrooke practices include composting, recycling, reuse, and diversion of excess edible fruits to other charities and non-profits around the city. Some of the fees will enable Fruits of Sherbrooke to continue to create it's programs of creating a directory, collecting and re-directing excess urban fruit that grows in this city. In this manner, more food gets to people who are willing to use it, waste is reduced and fruit from the ground goes to animal farms. We are also looking for new and creative options for using the over-abundance of apples and crab apples in the city. 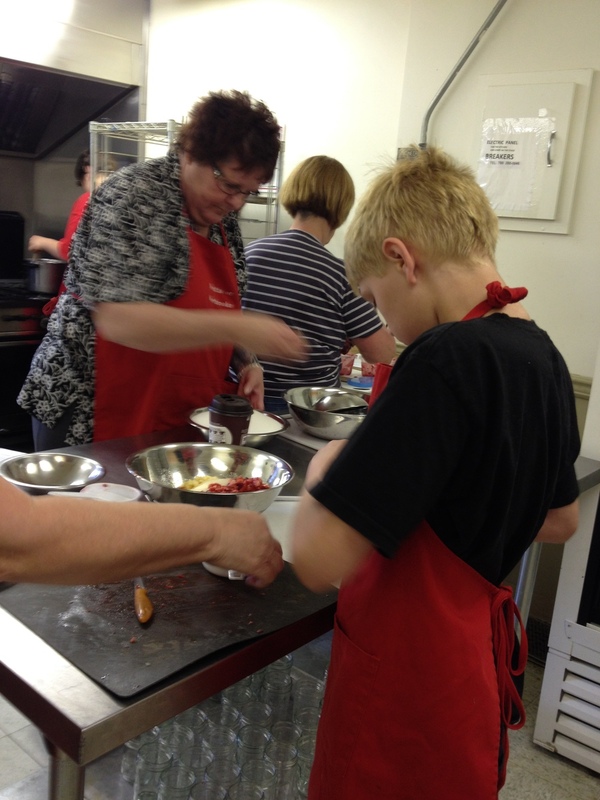 Others: A portion of the fees for the course will be applied directly to the Cherry Stone Soup Program. Through this program the Fruits of Sherbrooke will be offering free workshops to low income groups as identified by Alberta Health (such as community kitchens), new immigrants as identified by Catholic Social Services and the Mennonite Centre for Refugees and other community resources. This program is already being trialed. The funds are needed to provide the participants with jars and supplies and the dream is to have enough funds to supply participants with equipment such as canning supplies or a dehydrator. Eventually we would like to have the funds to set up a system that would connect those with excess with those who are willing to pick and use. So the fees from the course will help Fruits of Sherbrooke to run and administer their programs that connect excess fruit to those who will use it. Please read the course description and call us to find out how we can work together. We are able to customize a day if you want to made a product for your office, for a fund-raiser or other purposes. We are open to considering all queries.